I was first introduced to CrossFit while living in Colorado Springs through my friends in Olympic Weightlifting, Natalie and Casey Burgener. I found that it combined what I loved from my background in martial arts—no-holds-barred, high intensity training—and the technical, heavy barbell movements of weightlifting with other skills I had always wanted to learn, such as the gymnastics components. My first workout was Cindy, and although I didn’t know how to kip the pull-ups, I was hooked (it’s still one of my favorite workouts). One of my favorite things about CrossFit is how it encourages the development of new skills, rather than just mindless repetition. 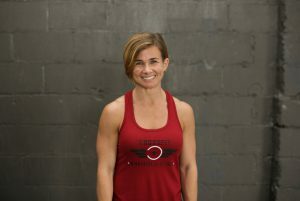 I trained in a traditional gym environment for seven years and taught at a vocational school for personal trainers for four years before coaching CrossFit. Now, there is no going back. I love the opportunity CrossFit gives me to teach, and watching my athletes develop inspires me in my own workouts and my growth as a coach.